Truck underride is what frequently happens when a passenger vehicle collides with a large truck. The passenger vehicle goes under the truck and the crashworthy safety features of the car are not able to work. Or, to put it another way, the truck enters the passenger occupant space of the smaller vehicle — too often resulting in horrific death and debilitating injuries. 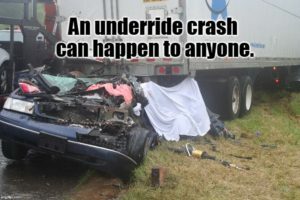 Hundreds of people die this way every year — the victims of senseless, preventable death by underride. Yet, for decades, this problem has been left unchecked. Little has been done to preserve the occupant space and make truck crashes more survivable. Why is that? Basically, the government has waited for the trucking industry to prove that it could do something to prevent these deaths. The trucking industry, for its part, has been waiting for the government to tell it whether or not, and how, to address this problem — before devoting R & D resources to it in order to come up with solutions. Meanwhile, the unsuspecting traveling public is left vulnerable and precious blood continues to be needlessly spilled on our roads. Stalemate. Catch 22. Limbo. Standstill. Impasse. The STOP Underrides! Act of 2017 will break this deadlock and get the ball rolling so that creative engineers can put effective underride protection on every truck — resulting in more truck crash survivors who can live to see another day. This bill has been drafted by Senator Kirsten Gillibrand. On December 12, 2017, Senator Gillibrand, Senator Rubio will be introducing this bill in Congress, along with Congressman Steve Cohen, who will be introducing a House Companion Measure. They are all seeking Republican co-sponsors for this long-overdue, life-saving legislation. Please SIGN & SHARE the STOP Underrides! Bill Petition: Congress, Act Now To End Deadly Truck Underride! 1896 A patent for a side underride protective device for street cars was issued on July 14 1896 and cited by numerous more recent underride patents: http://www.google.com.pg/patents/US564027. 1913 An application was filed in 1913 for a patent for a “Safety Device for Motor Vehicles” to provide underride protection for the sides of large trucks. https://www.google.com/patents/US1127241 Since that time, numerous patents have been published which refer to this patent (with the patent information organized in these columns: Citing Patent, Filing date, Publication date, Applicant, Title). See more in this recent post. In order to gain a basic understanding of the deadly but preventable truck underride problem, a compilation of helpful resources is provided below. On October 12, 2017, staff from Congressional Offices gathered to hear presentations from five experts on the topic of truck underride to better understand the need for the STOP Underrides! bill. The presentations were followed by a question & answer period as legislative staff sought to understand the problem and solutions of deadly but preventable underride crashes. Jason Levine, Director of the Center for Auto Safety, discusses the flaws in the cost/benefit analysis of truck underride protection. Robert Lane, VP of Product Engineering at Wabash National — a trailer manufacturer, discusses their commitment to development of rear and side underride protective devices for the prevention of underride deaths and debilitating injuries. Matt Brumbelow, a research engineer at the Insurance Institute for Highway Safety (IIHS), discusses the problem of truck underride and the research which IIHS has done to study rear and side underride protection. Keith Friedman, Friedman Research Corporation, discusses Front Underride Protection. Hosted by Lois Durso (https://stopunderrides.org/) and Marianne Karth (http://annaleahmary.com) who are working to STOP Underrides! in memory of their daughters — Roya Sadigh and sisters AnnaLeah & Mary Karth. WUSA9 recently began an extensive investigation into truck underride. The segments which have already aired are listed here. They plan to shed light on the problem until it is adequately addressed in this country. For more information on truck underride, go here.